One of the best things about summer is the chance to eat barbecue food. There’s something primal about eating beef, pork, chicken and fish that has been scorched by open flame. If we’ve abandoned our hunter-gatherer roots by downing our spears and grabbing our food from the frozen aisles of Tesco, at least we can keep that spirit alive through barbecues - that's why we've got our lists of the best BBQs as well. But that doesn’t mean you can’t bring some mod-cons to the open flame experience. Barbecue accessories aren’t limited to comedy hats and “I’m with stupid!” aprons. T3 Roundups are product guides where we've chosen the products based on our opinion. Usually we'll also only include a product in one of these 'best' lists if they're highly rated by users and/or appear in the best-seller lists at major retailers such as Amazon, Argos or John Lewis. You can add all sorts of wonderful flavours to your food, from dark smokey flourishes to beer-soaked infusions. Then there are the accessories that just make your life easier when it comes to cooking the food itself. Besides the obvious starting points like tongs (essential), a timer (don’t “go on feel” for the sake of your guests) and a coolbox (drinks will keep you going), here are the best barbecue accessories you need to complete your summer cooking fun. Not only does this have a cool name, the Char-Broil Smoker Chamber will quickly become the cornerstone of your barbeque parties. It’s a doddle to use. You put wood chips in the chamber, put the grate on top, add the food on top of that and slam the chamber on top of your grill. You’ll get a gorgeous smokey flavour to all your food but the problem is, you’ll start wanting to add everything in there to see how it tastes – chicken, meat, fish, pizza, pasta, soup, crisps, books, children, etc. Experimenting is where the fun lies and it’s only because it’s so easy that you’ll channel the spirit of Heston Blumenthal by smoking anything and everything you can get your hands on. When you bring guests over for your barbeque party, you want them to leave with stories of a great time they had. They’ll tell everyone about the spicy BBQ chicken sliders you made, or how Sarah had too much to drink and fell over a chair, or how Jeff accidentally broke next door’s window with a football in the excitement. What you don’t want them to do is leave with salmonella and spend the next two days vomiting in their bathroom toilet. 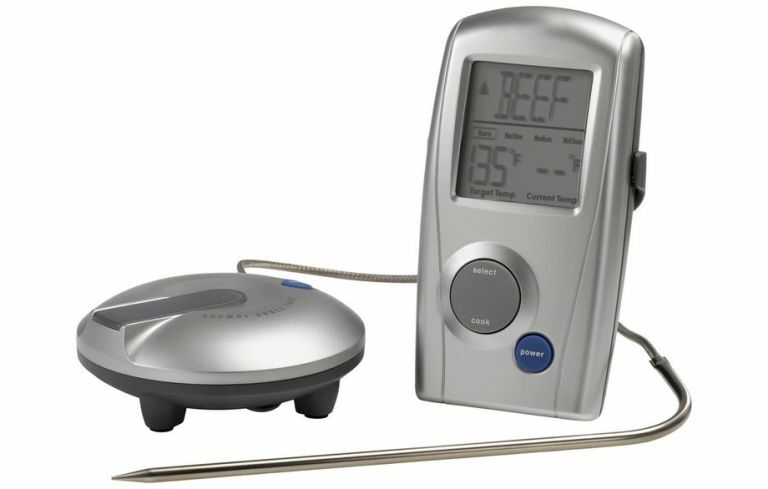 Barbequing meat isn’t always a precise art but this digital thermometer makes it one, so you can see if the meat is cooked inside before serving it to guests. Hide the football while you’re at it. You might be scoffing at the idea of a hamburger press right now. “Piffle!” you might have cried in disgust, having seen the picture and the concept. “Why can’t people make their own hamburgers?” Oh, but have you tried? Forming perfectly round slabs of meat with the perfect thickness is nearly impossible with human hands, the end result looking like a wonky beef UFO that’s slammed into too many planets. This hamburger press takes all of the guesswork out of the dark art of making hamburgers and it’s such a well-built piece of kit, you’ll feel like a Michelin chef just doing so. You can even adjust its size to the hamburger you want. Fantastic stuff. Look. Not everything you see on T3.com has to be a wizardry beamed to us from a techno-future we can only dream of. True, most things do because gadgets and gizmos are more fun, but sometimes you can’t beat the classics. And by that, we mean sometimes, all you really need is a metal basket for your barbeque. It’s not going to win you any Cool Points with your friends and you can’t exactly announce “look what I bought this weekend!” and expect anyone to be blown away. But good lord this is practical, as a simple means to solving the age-old bits-of-food-keep-falling-in-the-coal-sad-face problem. Simply put – every barbeque needs one, especially if you’re as serious about gobbling up every morsel of food as we are.